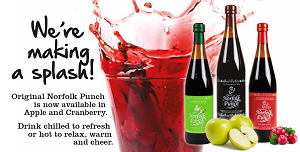 Herbal Fusions Ltd proudly took over the family business Norfolk Punch in June 2013. As the owners of this wonderful product, we are committed to continuing to build on the legacy handed down through the generations. Norfolk Punch’s excellent pedigree and heritage speaks for itself and we look forward to introducing the full range of accompanying products over the next few years. You will find us at various trade and consumer shows through the year. Please see our Events page for further information.